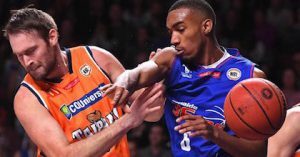 Two-time FIBA youth world champion Terrance Ferguson suffered through a tough blowout loss in the Australian professional NBL league, going scoreless without a rebound or assist with three turnovers in 20 minutes of action for the Adelaide 36ers. Ferguson, in fact, did not even attempt a shot while picking up one foul in a 105-87 home defeat against Brisbane Bullets. It was just the second time in eight games that Ferguson failed to score a point. Going into the game, he had been averaging 6.7 points, 1.6 rebounds and 0.4 assists while hitting 38 percent of his three pointers in 17 minutes a game. Ferguson, who had averaged 5.8 shots per game, was never able to get into the Adelaide offense. The ball-dominant under-sized point guard Jerome Randle (averaged 23.9 points, 16.8 shots and 4.8 assists per game coming into the game) could not get Ferguson in position to take advantage of his effective three-point shooting. The team definitely could have used an effective Ferguson from outside after they suffered a 2-of-27 three-point shooting performance in their previous game – with Ferguson going 1-of-4 from long range for his only three points of the game in 17 minutes. Ferguson in fact barely even touched the ball in the first 17 minutes against Brisbane. It wasn’t until the final three minutes of the first half in which the former University of Arizona commit got the ball in his hands. It was in that stretch when he committed his only turnover of the first half, travelling after getting a bump from a defender. Ferguson’s line for the first half was 0 points on 0-of-0 shooting with 1 turnover and no other stats. Early in the second half, the 2014 FIBA U17 World Championship and 2015 FIBA U19 World Championship winner got the ball after a teammate’s long rebound but his bounce pass to a teammate cutting to the basket went untouched out of bounds. Midway through the fourth quarter, Ferguson passed up an open three-pointer to pass over the top to Majok Deng in the paint but the ball went over the big man’s out-stretched arm. Indicative of the performance for the whole 36ers team, while Ferguson and Deng were giving a slap of encouragement to each other, the ensuing in-bounds pass went the length of the floor to Brisbane star Torrey Craig, who was all alone for a dunk after he had saved the previous ball but flown out of bounds and was only getting back onto the court. Physically, Ferguson does not look out of place in the NBL. He looks a bit skinny still but it’s not a problem that opponents can really take advantage of at all. Defensively, Ferguson did not make any major miscues (other than him and the rest of the team sleeping on the long in-bounds to Craig when the game was long decided). His man did not really score a lot of points – though 36ers coach Joey Wright did not really put Ferguson on Craig, who put up a career high 41 points in the game. Craig did score a couple times on Ferguson, once on a break and another time driving to the basket though Ferguson’s defense forced Craig to hit a tough layup with the left hand to finish – with Craig getting the and-one as well. It seems that Ferguson needs to get a little selfish and go get his own shots and points. Adelaide definitely could have used his ability to score – which he has shown as he hit 10 points in his first professional game and also scored 13 points against Melbourne United, incidentally which came after Ferguson’s only other scoreless game where he also did not hoist up a single shot. For those who haven’t been following Ferguson’s progress in Australia, the youngster also made some negative headlines in late October when he was banned for two games for allegedly “striking” Mark Worthington in the 36ers’ game against Cairns.